Can't choose between Retail POS and Restaurant POS? Do you have a Retail Shop with a Coffee shop inside the store? Do you have a Restaurant or Coffee shop but you also sell stock items? Do you want all the Restaurant Features (working with tables, keeping multiple sales open, waiters, etc) but also all the Retail Features (scan items, quotes, etc)? You now no longer need to choose between Retail POS or the Restaurant POS modules. You can use both. 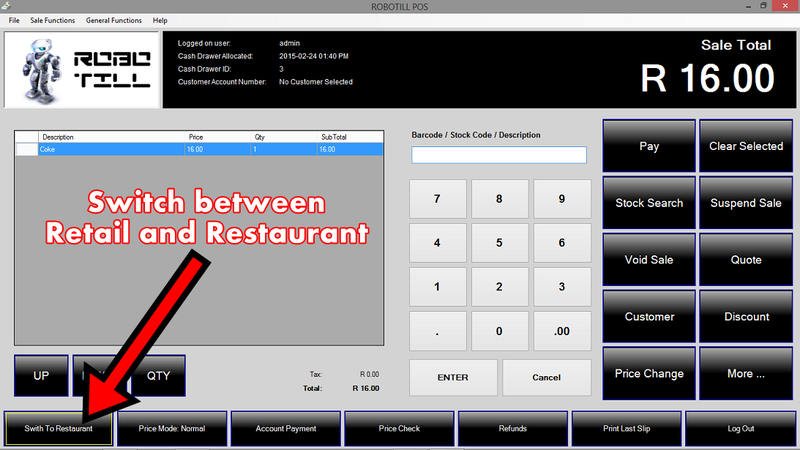 In Version 4 of ROBOTILL, there is now a Switch button that will allow you to quickly switch between the Retail POS Module and the Restaurant POS Module. If you only want to use the Retail Module or the Restaurant Module, you can hide the new 'Switch' button. In Manager go to Setup > System Configuration > General Tab and check the 'Hide Switch Button in the POS Modules'. There is a FREE Edition that you can download that does not expire.